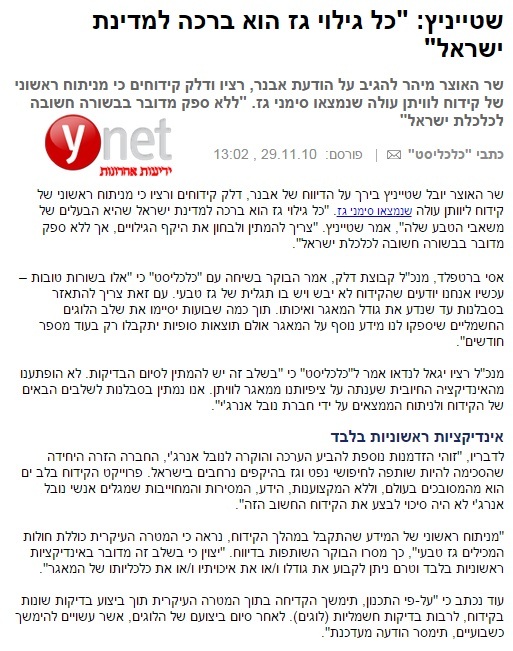 In an interview with YNET, Ratio CEO Yigal Landau spoke about the reports issued by Delek Drilling, Avner and Ratio regarding signals of possibilities of existence gas at the Leviathan site. Finance Minister Yuval Steinitz said these signals were a true blessing for the government, which owns all natural resources found within the State’s economic borders. “It’s wonderful news for the Israeli economy, but we would do well to wait till the full range of this discovery is better understood,” said Steinitz. Yigal Landau said that testing still needs to be carried out in full at Leviathan. He added that the positive indication came as no surprise, and had been expected. “We will now wait for the next stages of drilling and for receiving the full analysis of this discovery. We are owing our thanks and appreciation to Noble Energy, who was the only company willing to become a partner in large-scale oil- and gas-exploration in Israel. Deep-sea drilling is considered to be a complicated procedure, and without the know-how and expertise from Noble, there was no chance of accomplishing it,” said Landau. This entry was posted in In the Media, Oil and Gas Exploration and tagged Deep-sea drilling, Delek Drilling, Leviathan, Noble Energy, Ratio CEO Yigal Landau, Yuval Steinitz. Bookmark the permalink.